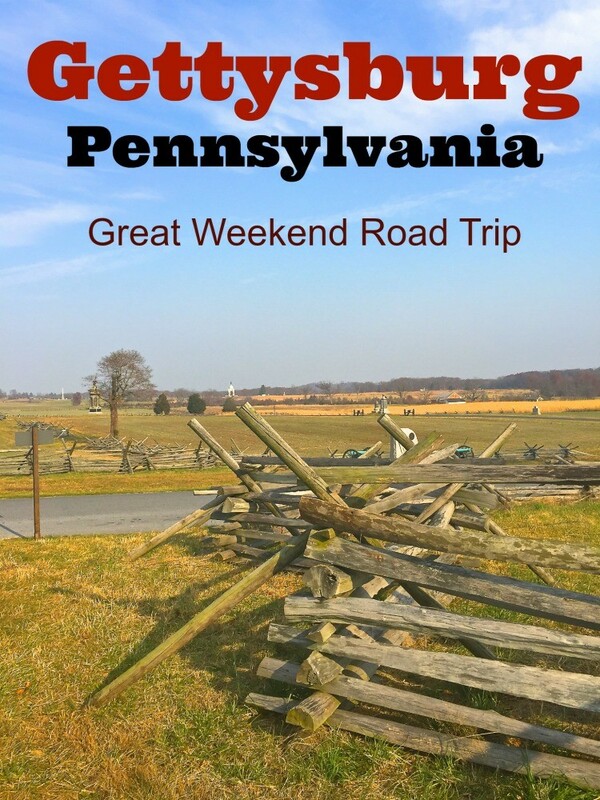 For a parents-only weekend getaway, Sarah Ricks, Philadelphia TravelingMom visited Gettysburg, Pennyslvania. They loved exploring city’s fascinating Civil War history, national military cemetery, and its 19th century architecture. For three bloody days in July 1863, Confederate and Union armies fought with cannons, guns, and bayonets on farmland near a Pennsylvania town, Gettysburg. The Southern army was coming off series of victories and was invading the North. But the battle was a turning point in the Civil War. The Union victory reinvigorated the war effort in North. We traveled with friends to Gettysburg, who suggested we book a private guide to tour the battlefield. I’m glad we did. 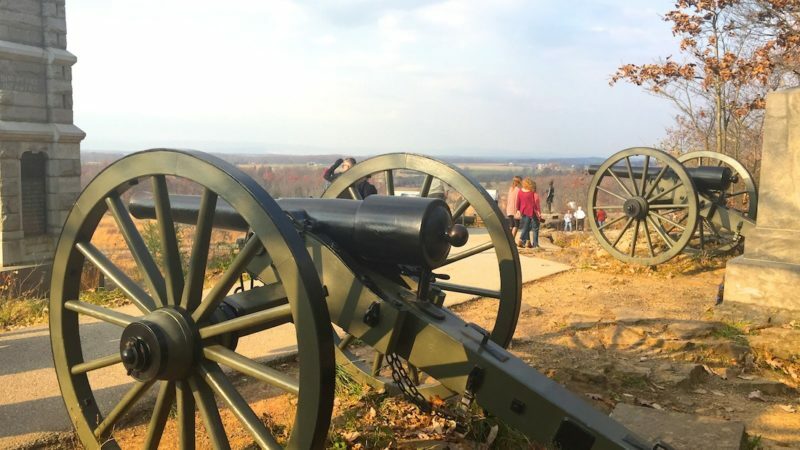 The Gettysburg Foundation recommends booking tours several days in advance. For $65, our guide (Chuck) drove our car around the battlefield for two hours, answered our nonstop questions. We learned about the history leading up to the battle and the battle itself. We stopped many times to explore the battlefield and the monuments dotting the farmland. A self-guided car tour is free. While we didn’t try them, the National Park Service offers both bus tours and car tours, for a fee. The Gettysburg battle sprawled over farmland, rocky hills, and fields. Now the battlefield and the nearby cemetery for the soldiers are all a national park. 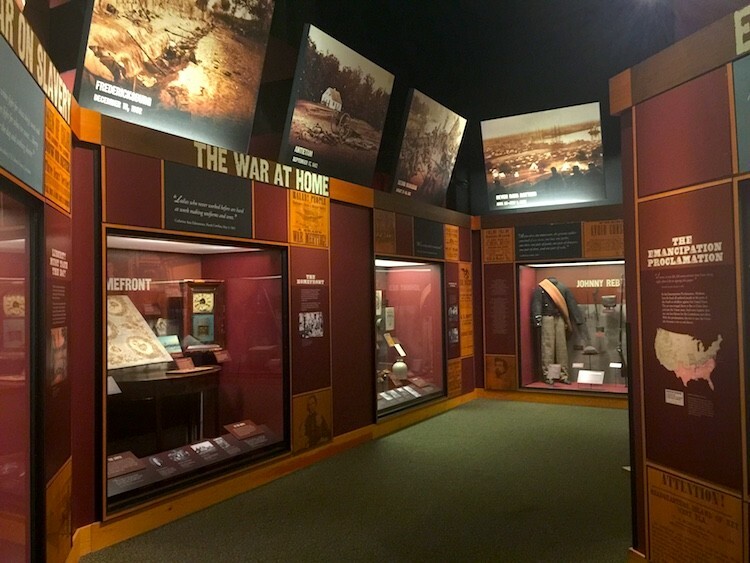 Don’t miss the Park’s Museum and Visitor Center. The museum has several rooms. We learned about the life of Civil War soldiers, life at home during the War, and political history before and after the Civil War. It has original artifacts, like soldiers’ uniforms. One army recruiting poster was aimed at German-speaking Pennsylvanians. An interactive exhibit that challenged me to choose items for a soldier to carry gave a sense of the physical strain of a soldier’s daily life. 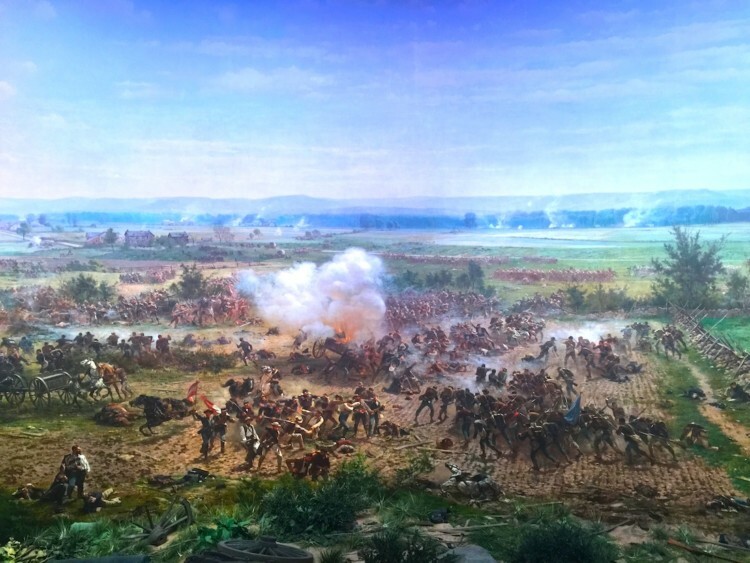 Even though it sounds hokey, I enjoyed the enormous painting of the battle, called the Gettysburg Cyclorama. In a circular room, we were surrounded on all sides by the painting, which is 42 feet high and nearly 400 feet long. It was painted in the 19th century. The museum presents the painting with sound and light effects. The Visitor Center bookstore is excellent. There are kids’ books, games, videos, serious history books, and souvenirs. I happily spent a half hour choosing Civil War history books to take home. The thousands of Confederate and Union soldiers killed at Gettysburg were buried first in shallow temporary graves. Several months later, Union soldiers were reburied in the first national cemetery. Walking around the graves, seeing the different states, was a moving experience. The motto of the Gettysburg National Military Park is “our country’s common ground.” It is a national cemetery, but our “common ground” includes the ideas that unite us as a country. This year it was especially good to remember our country’s common values of equality and government by and for the people. The Wills House Museum was the elegant mansion of wealthy David Wills, who helped organize the national cemetery to honor the Union soldiers killed in the Civil War battle in Gettysburg. President Lincoln stayed overnight at this house before dedicating the cemetery with the Gettysburg Address. 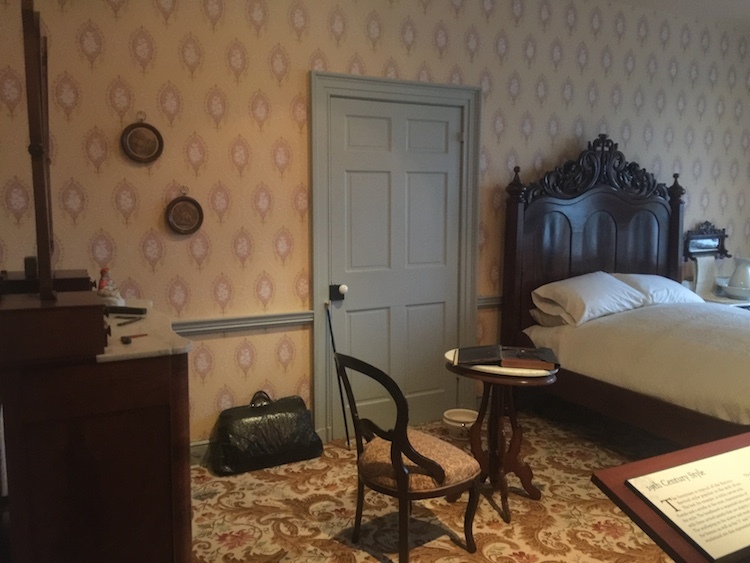 It was exciting to visit the bedroom where Lincoln put the finishing touches on the speech that changed Gettysburg from a battlefield to a symbol our nation’s shared values. The Wills House Museum has informative videos, photographs, and explanations, and period furniture. It is a self-guided tour. While we did not have any kids with us for this weekend getaway, older kids might enjoy the history here as much as we did. 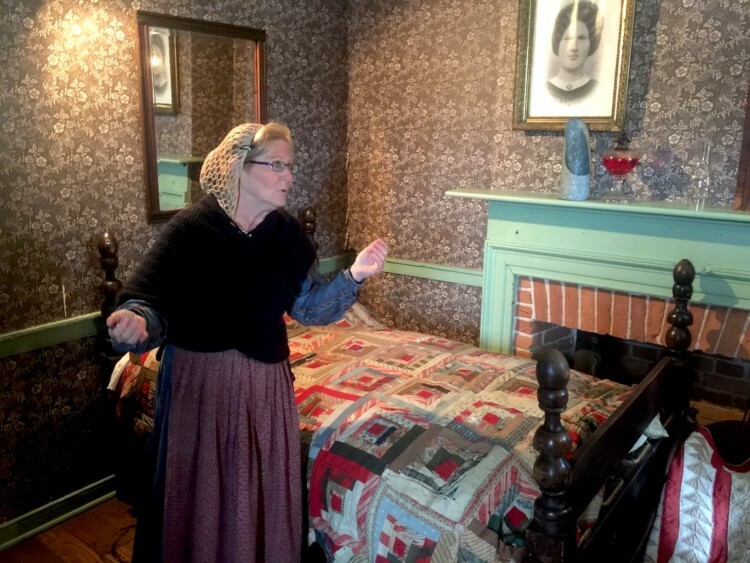 Even younger kids will enjoy the Jennie Wade House. This small house museum gives a sense of how a typical family might have lived. Our guide wore a 19th-century dress to tell the story of Jennie Wade while walking us through the 4 rooms of the small house. Jennie Wade was the only female casualty of the Gettysburg Battle. She was home baking biscuits for soldiers and her family when a stray bullet came through her door, killing her instantly. Photographs and personal details about Jennie Wade’s short life helped to get a sense of the challenges faced by a poor family living in 19th century Gettysburg. We worked up an appetite touring the battlefield and happily indulged in the hearty American food at the Dobbin House Tavern. At this 1776 house, listed on the National Register of Historic Places, dinner is served by candlelight, by wait staff in colonial costumes. Gettysburg is a convenient drive from most of the northeast. We drove about 2 hours from Philadelphia. Our friends drove just over 3 hours from New York. Gettysburg is about 75 miles from Washington DC. For other tips on what to do in Gettysburg, click here. 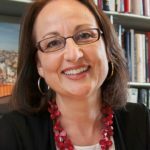 If you’re combining a visit to Philadelphia, check out free fun things to do in Philadelphia, and ideas for where to eat in Philadelphia. 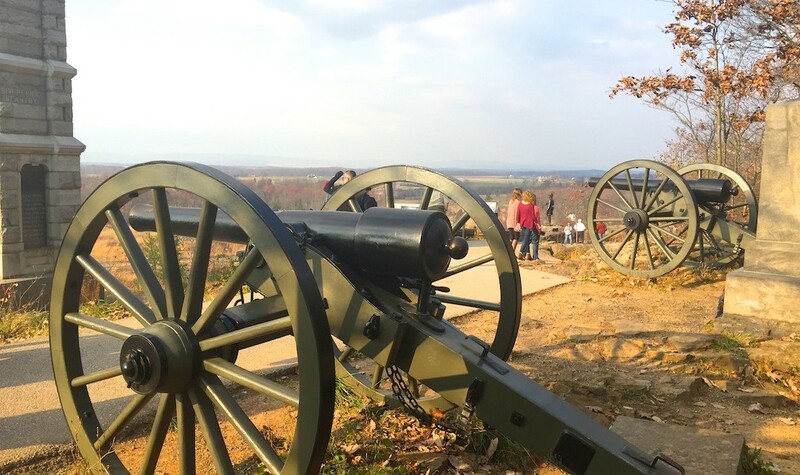 HAVE YOU VISITED A CIVIL WAR BATTLEFIELD? TELL US ABOUT IT IN THE COMMENTS.